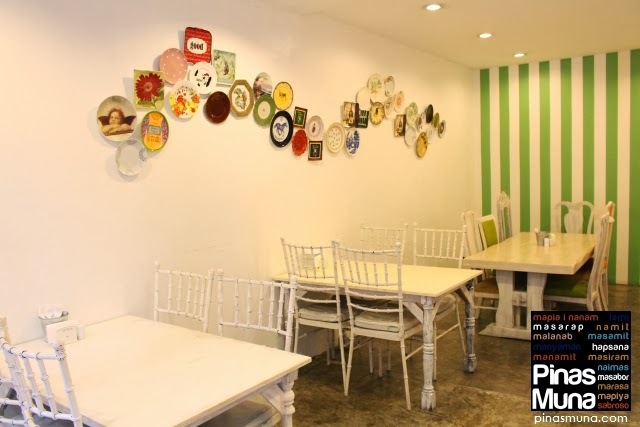 Cucina ni Bunso is a newly opened Filipino Fusion restaurant in Quezon City. It is the "baby" of celebrity chef Mel Martinez. 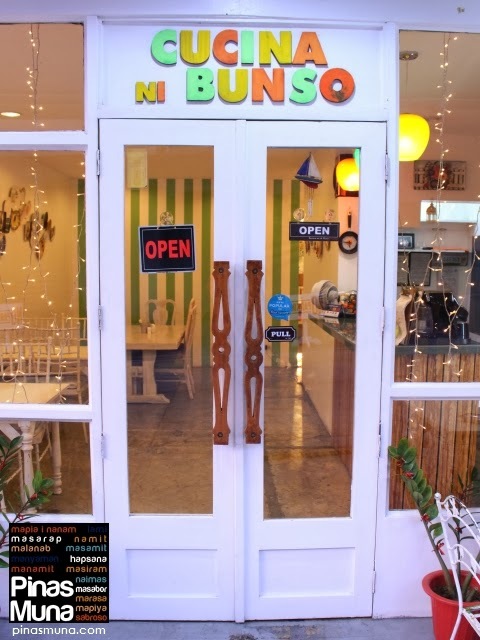 Located along Scout Lozano Street (near the corner of Tomas Morato), Cusina ni Bunso serves everyday favorite Filipino cuisine with Chef Mel's creative twist to the recipe. 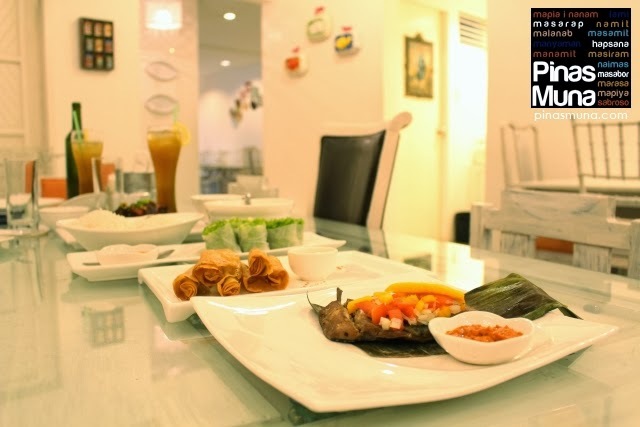 When you enter the restaurant, you will be greeted by the bright interior and the colorful plates decorating the wall. 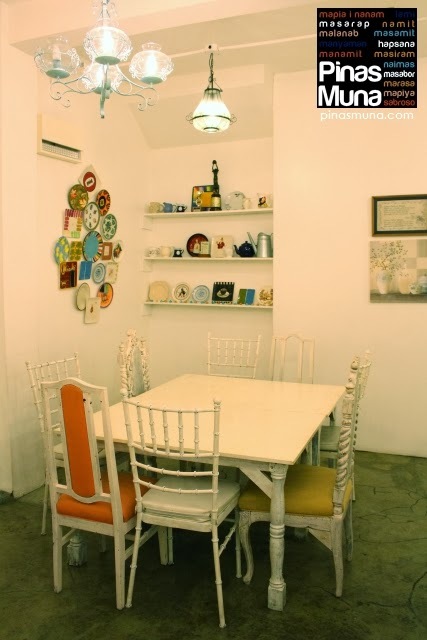 The faded white tables and the warm lights bring a homey feel inside the restaurant. Further into the restaurant, a more spacious hall welcomes the guests with long tables, elegant chandeliers and colorful decors. 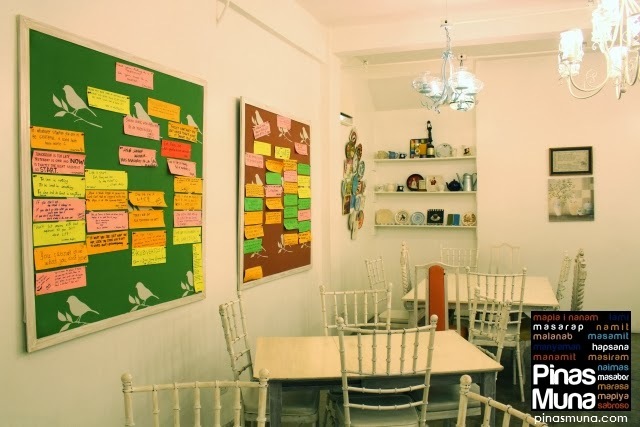 The restaurant's ambiance evokes a sentimental feeling of one's home and family, which is what Cucina ni Bunso is all about. Most of Chef Mel's dishes are recipes he learned from his mom. Cooking and eating home recipes bring back memories of our childhood, the fun experiences we had with our siblings, and the story of us growing up in the loving care of our parents. 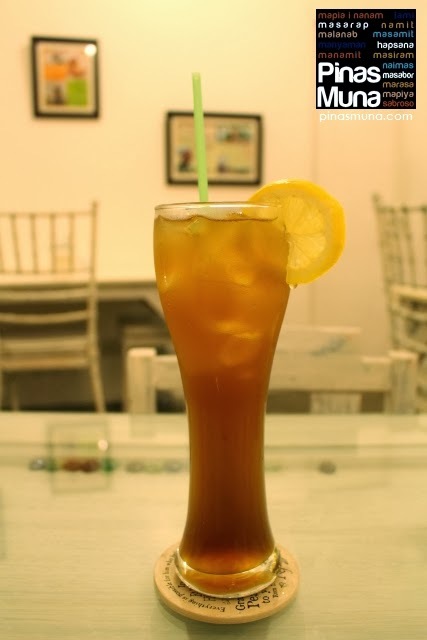 As soon as you are seated, order their refreshing Lemongrass Cooler. It will instantly set your mood while ordering your food. No wonder it is a bestseller at Cucina ni Bunso. It is available per glass, or for a bigger group, you can order it in a carafe. 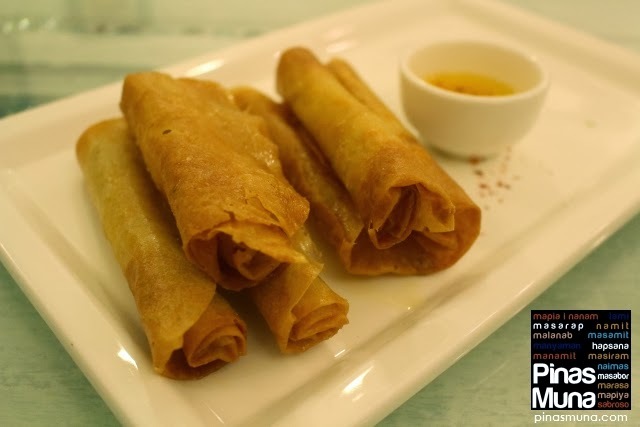 For appetizer, we recommend Meliton's Spring Roll. 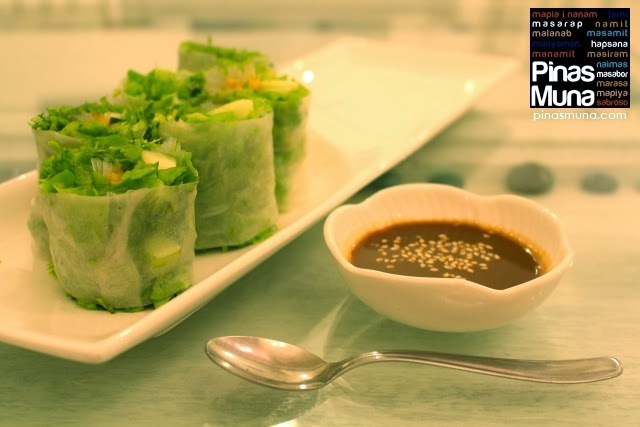 It is a vegetarian dish served with their special peanut sauce. The sauce gives the fresh veggies and the mangoes an exotic flavor. The taste is somewhere between the Filipino peanut sauce used for the lumpiang sariwa, and the Thai peanut sauce used for satay. Really interesting blend of flavors. We have seen different versions of sisig, and this one is truly unique. Unlike the usual sisig, the meat used here isn't fatty at all. They don't feel heavy on the taste. To balance this dish, Chef Mel created this very wonderful sauce that we really loved. The lemon vinaigrette perfectly matches the sisig turon. It helps a lot in eliminating the umay effect, making this dish actually quite refreshing to taste. This seafood stew is deliciously creamy. Served with a generous amount of clams, squid and shrimp, this is definitely perfect for seafood lovers. Chef Mel's version is slightly spicy, which is quite okay for a seafood dish as it lessens the stench of the seafood ingredients. 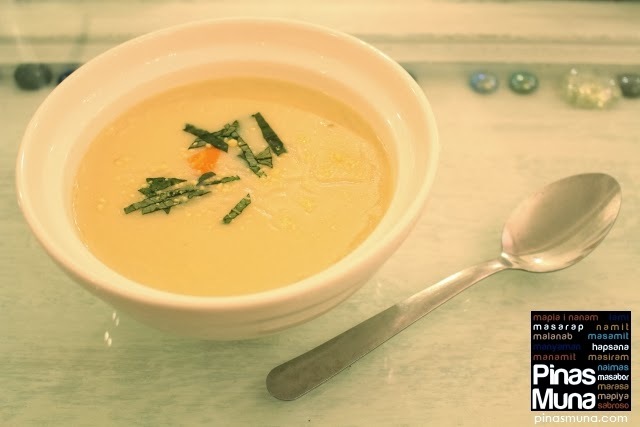 You'd surely want this whole bowl of soup for yourself! I love my mom's daing na bangus (milkfish) which made me a big fan of this fish. That is why I was delighted to learn that there's a bangus dish at Cucina ni Bunso. 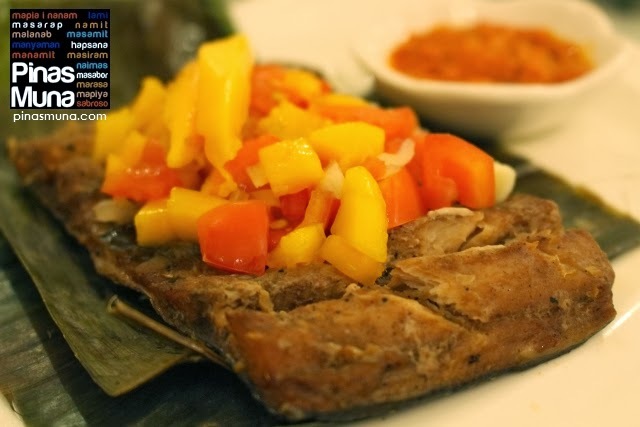 In addition to the usual tomatoes and onions, their bangus is also topped with mangoes. The tomatoes gives the dish a sweet and sour taste, a perfect ingredient to balance the flavors. It is then wrapped in banana leaves and served with talangka sauce. The talangka sauce is actually make of crab-fat (aligue in Tagalog) which make this dish very rich and oh sooo yummy. This dish is perfect with steaming hot plain rice. Chef Mel gave an American twist to our favorite Filipino dish, the adobo, by serving it like a stake on a bed of mushed potatoes. It is then topped with parsley and green olives. The adobo sauce is served separately, functioning like a gravy for the stake. 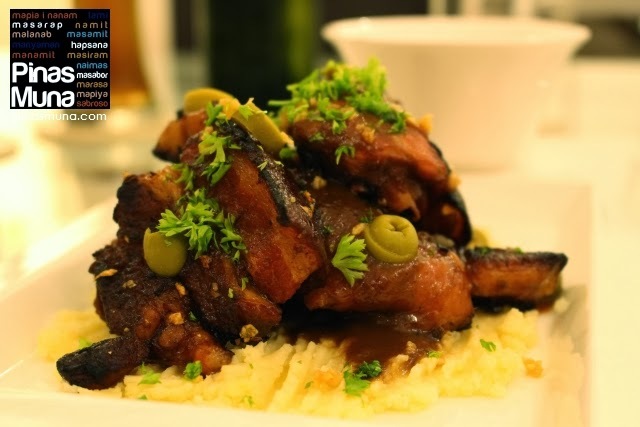 It tastes like adobo with a bit of a smokey flavor. This dish was Edgar's favorite because it reminded him of his childhood, how their home-cooked adobo tasted. For dessert, we had this cross between fruit salad and turon. 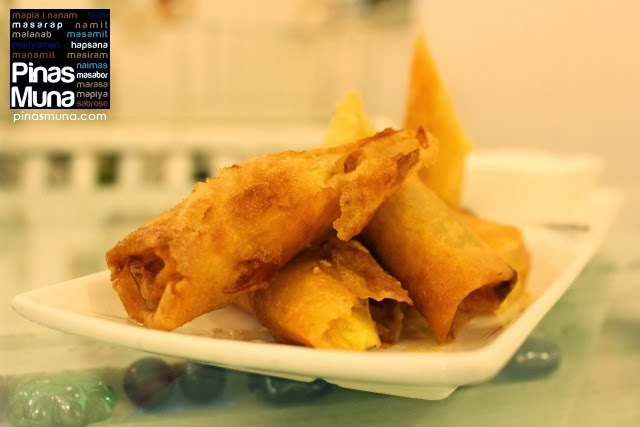 Instead of canned fruits, Chef Mel used fresh fruits which we wrapped in lumpia wrappers, and fried until golden brown. It served with a scoop of buko-pandan ice cream. It's really quite simple, but very original and creative. Why "Mikael"? It was named after celebrity Mikael Daez who requested Chef Mel to create a dessert for the Christmas season. Chef Mel made one and named it after him. 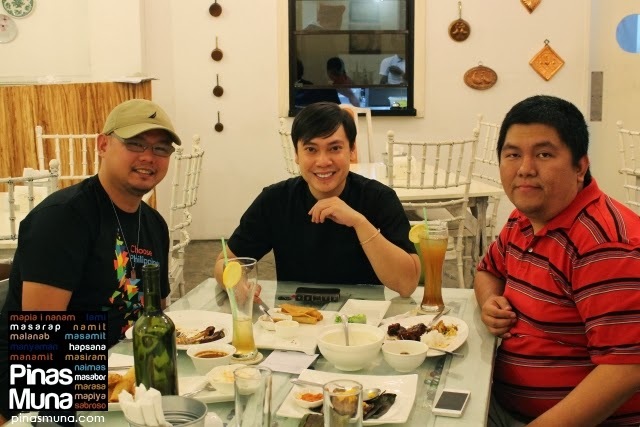 We are happy that Chef Mel Martinez decided to open a Filipino restaurant. No other food is closer to every Filipino's heart that Filipino food. Overall, Cucina ni Bunso is perfect for families and friends craving for their favorite Filipino dishes. We assure you that Chef Mel's creative twist to his recipes will surely surprise and delight everyone. We would like to thank Chef Mel for having us at his very own Cucina ni Bunso. We learned that Chef Mel also loves to travel and plans to visit different parts of the Philippines to learn other regional dishes which he can recreate in his restaurant. We are looking forward to your travels and your culinary discoveries Chef Mel. 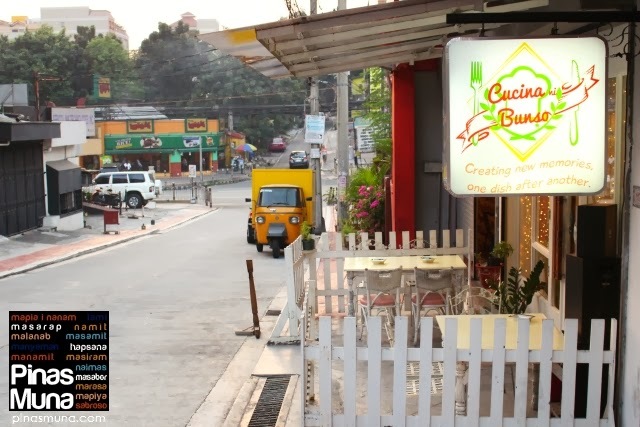 We invite you to visit Cucina ni Bunso and try their Filipino fusion dishes. Check out their menu and let us know what you think about their food. We might also try your recommendations when we revisit the restaurant. Bring it to the next level by inviting your barkada on a weekend staycation in Quezon City. Tune Hotel Quezon City is located along Timog Avenue, only a few blocks away from Scout Lozano Street. Don't forget to include Cucina ni Bunso in your dining itinerary.